Mostly sunny skies this morning will become overcast during the afternoon. High 64F. Winds N at 5 to 10 mph..
Overcast. Low 41F. Winds light and variable. 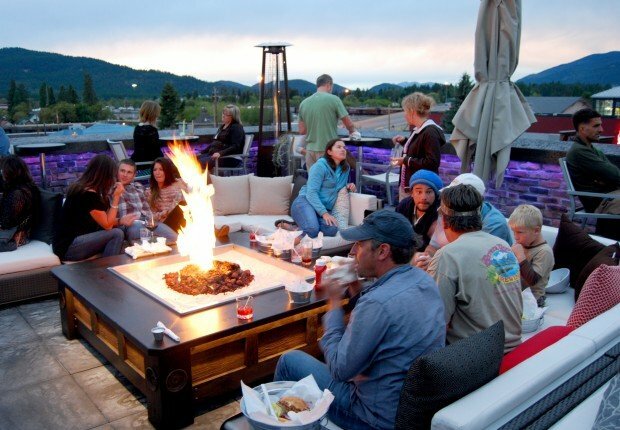 Customers gather around the open-air fireplaces on the heated rooftop “sky bar” at Casey’s Pub and Grill on a recent weekday evening. The new Casey’s Pub and Grill building, located on the corner of First Street and Central Avenue in downtown Whitefish, adds an uncharacteristic but welcome flair to the city center. WHITEFISH – Exactly one year after demolishing the oldest building in Whitefish and unfurling an ambitious blueprint for a five-story nightclub – complete with a heated rooftop “sky bar” – the owners of Casey’s Pub and Grill opened their doors to great fanfare last weekend. The long-awaited debut of Casey’s followed months of heavy construction as builders transformed the high-ticket parcel of downtown real estate from a heap of rubble into a multi-tiered, 17,000-square-foot mega-pub crafted out of reclaimed Montana hardwood and recycled brick. The nightclub features five stories including the rooftop and basement, which is equipped with a full kitchen. The main level and the rooftop bar each have their own grill and unique menus, while a second-level dance floor, music stage and overlooking mezzanine will keep late-night revelers going long after the dinner hour. The dance floor and lounge area are outfitted with a 10-foot television screen and two seven-foot screens, which promise to draw in the sports fans. Even though the big-city flash of Casey’s is unique to Whitefish – the brick exterior is fringed with colored lights that change on a nightly basis, an effect that is garish but not gaudy – and its flair is a marked departure from the old Casey’s, the small-town prices are competitive, and the menu features eclectic fare that will appeal to the burger-and-beer crowd as well as culinary thrill-seekers (think truffle fries, kabobs and Thai tacos) for prices that range between $4 and $13.50. Well drinks and pints of beer cost about $3. Eric Payne, owner of Frontier Builders, bought Casey’s, located on the corner of Central and First Avenues in downtown Whitefish, in 2011. Payne is a partner in Whitefish Frontiers LLC, the group that owns the empty but valued lot adjacent to the Craggy Range Bar and Grill. At its official opening on Friday, Aug. 31, Payne and Guercio ushered more than 3,000 customers through the doors. Plush couches and stylish pub tables provide seating, and the rooftop bar’s heated floor and assembly of gas heaters will warm customers through the winter, when après ski activities become popular downtown. On a recent weekday evening, a three-piece jazz group – Rebob: A Jazz Collective – played for the members of a varied crowd that included a retired judge, a real estate agent, a nurse and a backcountry ski guide. The establishment is still working out the kinks, and the opening of the rooftop grill was delayed due to a problem with an equipment order. Casey’s operates as a “smart building,” and Guercio controls everything from the food and drink orders to the television setting from an iPad. On Wednesday night, as the crowd gathered for the opening night of the NFL season, Guercio had some trouble synchronizing the televisions. “We’ve got so many bells and whistles that we’re still trying to figure everything out, but it’s all state of the art,” Guercio said. 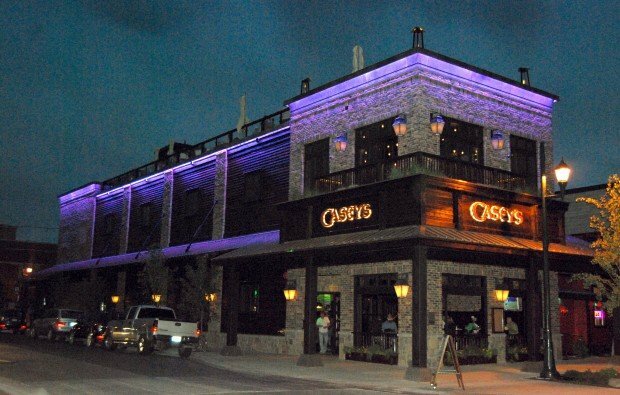 Visit Casey’s online at www.caseysbar.com. Missoulian reporter Tristan Scott can be reached at (406) 531-9745 or at tscott@missoulian.com.